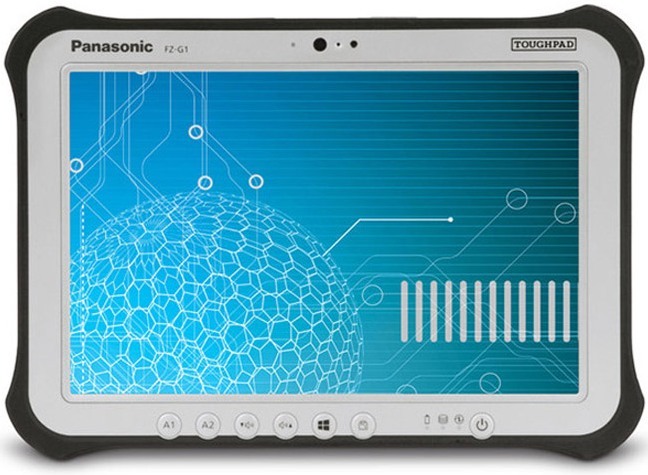 Panasonic Toughpad FZ-G1 features 10.1-inch sensor IPS display with 1920 x 1200 pixel resolutions. It is powered by Intel Core i5 Ivy Bridge processor with 4GB RAM and runs on Windows 8 Professional OS. The Toughpad FZ-G1 comes with (128/256)GB of SSD storage. The tablet comes with IP65 rating and is able to withstand harsh conditions and fully meets or exceeds the MIL-STD-810G military standard. Connectivity and Expansion options includes 4G, Wi-Fi, Bluetooth, GPS receiver, USB and HDMI ports. Toughpad FZ-G1 has a dimension of 269 x 188 x 19 mm and weighs 1.09Kgms. It claims a battery back up of upto 8 hours. Panasonic Toughpad FZ-G1 comes with a price tag of $2899USD and will be availabile from March 2013. Tags:Panasonic Toughpad FZ-G1, Panasonic Toughpad FZ-G1 features, Panasonic Toughpad FZ-G1 specifications, Panasonic Toughpad FZ-G1 review, Panasonic Toughpad FZ-G1 details, Panasonic Toughpad FZ-G1 availability, Panasonic Toughpad FZ-G1 specs, Panasonic Toughpad FZ-G1 images, Panasonic Toughpad FZ-G1 pics, Panasonic Toughpad FZ-G1 pictures, Panasonic Toughpad FZ-G1 price.